I was delighted to come across the Hart of Darkness cocktail in Jeff Berry’s Beachbum Berry Remixed (2010). Hart of Darkness is one of Berry’s originals, and its 21st century recipe fits nicely with his impressive compilation of mid-20th century tiki drinks. I’ve never understood the attraction of the tiki experience, with the grotesque mugs, the overdone fruit-and-umbrella ornamentation, and the faux Polynesian trappings. But the drinks, well, that’s another thing altogether. Despite their often goofy names, labor-intensive preparation and over-the-top presentation, many tiki drinks are rum-filled wonders; the Hart of Darkness is no exception. 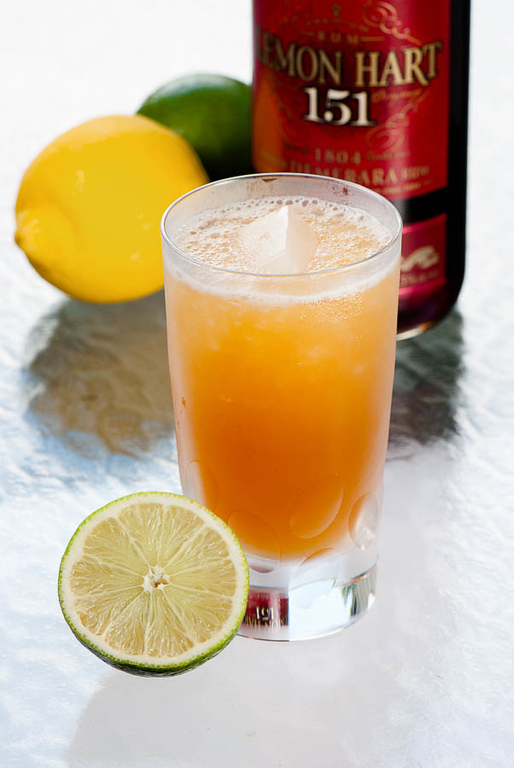 Two things about Berry’s recipe caught my eye: passion fruit syrup, which I’ve been keeping on hand ever since I learned the delights of the Hurricane; and Lemon Hart 151 demerara rum. Both elements are hat-tips to classic tiki tradition and the era of Trader Vic and Don the Beachcomber. 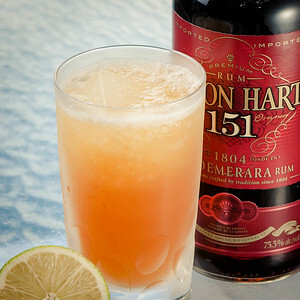 The drink’s backbone, Lemon Hart 151, is a high-alcohol, intensely flavorful mixing rum, with flavors of sugars and molasses, dried fruit, cinnamon and other spices I associate with first-rate apple pies. Maybe a little burned sugar, or even smoke. Until Hart of Darkness appeared, 151’s main use at my house was as a float on drinks like the Mai Tai, or as a contributor to cocktails like the Atlas; this is the first drink I’ve encountered where it is the centerpiece spirit. Put everything in a blender. Blend at high speed for 5 (10) seconds. Pour into a tall glass. Add ice cubes to fill. For starters, I’m impressed that Berry updated this drink’s presentation, calling for a “tall glass” instead of some sort of tiki mug. It’s also streamlined—no garnish anywhere in sight. I can’t figure out what the quarter-ounce of soda water is about. There isn’t enough of it to offset the acidity of the fruit, and a quarter ounce of soda or any other kind of water makes no noticeable difference in the way everything blends (and soda’s fizz certainly doesn’t survive either shaking or blending). It remains a mystery. On the other hand, nor could I figure out why Berry put the whole thing through the blender—and this time I found a bit of enlightenment. I’m not much of a blender drinks person, and this looked like just so much hokum. But this drink has everything else going for it, and I could hardly write about it without at least once making it according to the rules, so I gave it the full treatment. Once. Then twice. Now, maybe Berry’s blender is spiffier than mine, but the prescribed 5 second blend didn’t seem to change much about the drink. I couldn’t just let that rest, so on the second try, I gave it a long ten seconds, poured the drink, and then I understood: if the ice is fine enough, and the blend is thorough enough, Hart of Darkness will quickly put a most excellent frost on your glass, much as you would get from a swizzle. It’s a small point, and optional, I suppose, but it makes a delightful presentation. “The Hart of Darkness” at cold-glass.com : All text and photos Copyright © 2012 Douglas M. Ford. All rights reserved. Most people don’t realize that blended tiki drinks are blended so as to incorporate the water into the drink even quicker than shaking, not to create a slushy drink. That is an excellent point. For example, even with the extended 10-second blend I use for Hart of Darkness, the result is not slushy, but rather more like “crunchy.” I use crushed ice as the starting point, and it really only knocks it down part way. All that extra ice surface absorbs heat from the drink (and adds water!) really quickly.